President’s Message— This month promises to be busy and memorable. 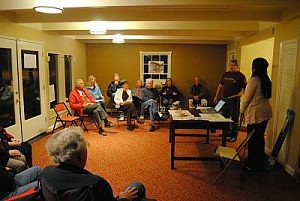 Our renowned potluck dinner-meeting comes up Tuesday April 24, and will feature Joshua Staab, editor of the Fair Oaks Patch. Patch is the online purveyor of Fair Oaks news, activities, business and opinion. If you haven’t logged on to Patch, you’re missing Jim Pearce’s wonderful blog on Fair Oaks history. Patch provides a great opportunity to generate interest in our history and the Society. Crews are scurrying to ready the new History Gallery for opening during the Fair Oaks Fiesta, May 5-6. Already, the construction committee has installed new carpeting, replaced doors and handles, renovated the bathroom, constructed new walls and cabinets, bought or refinished furniture and painted the interior. Design has been completed for a new front patio and accessibility improvements; and development of the exhibits themselves is advancing nicely. We continue to seek interesting photographs and artifacts for possible inclusion. We hope the Gallery will increase our visibility in the community and generate new members. Your president is scheduled to speak to the Fair Oaks Chamber of Commerce on April 19. I will spread the word about our mission, our meetings and programs, the History Center, the Gallery and our November 2 Soup Night. And finally, in case you didn't notice, this is the 100th edition of the Fair Oaks Historical Society Newsletter. Happy Centennial FOHS News! During the potluck at the January meeting, photos of the progress being made on the new History Building were displayed. Joe Dobrowolski then reported on the progress and introduced the committee working with him. Sarah Starke, master student at CSUS was introduced. Sarah reviewed her plans for the exhibits in the new history center. Two exhibits are being planned, the first is a permanent exhibit “The Heart of California,” which will chronicle the history starting with the Maidu Indians and continue to present day. The second will be a temporary exhibit that will be titled “Nourishing the Dream: Water and the Development of Fair Oaks.” Ralph finished the program by inviting the Society to attend an “Open House” at the center on February 28, 6:30 – 8:00, for the purpose of viewing the progress and providing input on the plans. 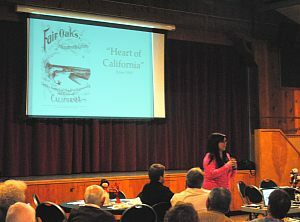 As Ralph mentioned, April's program will be The Fair Oak's Patch on-line newspaper, with editor Joshua Stabb presenting. If you aren't familiar with the Patch, check it out at http://fairoaks.patch.com. Work on the new history center continues. Because of the efforts and many donations of our members the status on the new building has really progressed. The interior of the building had new carpet installed, the new area was added to the front room, and the walls were taped, textured and painted. The bathroom vanity had a new top, basin and faucet put in, the floor was tiled and a storage cabinet hung. We’ve bought a new table and the four chairs have been stripped and stained to match. The plan for the front patio has been completed and bids are being requested. The same for the ADA parking in the rear. A work party was held and there were about 10 of us who cleaned up the front and back planter areas. Jim located a Kirby vacuum and attachments. New lighting and electrical work still needs to be done. Volunteers Needed: Seven couples have volunteered to do one month’s care each of the landscaping. So, we still need an additional 5 volunteers. It will mean only one day a week for a month of cleaning up, trimming the landscaping and checking the automatic sprinkler system. Call Joe at 961-6561. We are sad to report that long time Fair Oaks Historical Society member Betty Anne McArthur passed away on January 6, 2012 at age 94. Services were held January 12th at the Fair Oaks Presbyterian Church. Tickets for Soup Night will be sold at the July meeting. In an effort to meet everyone's needs, ticket sales will begin about 5:30. If you are unable to attend the July meeting please contact Joe Dobrowolski , just prior to the meeting, at 961-6561 or joedobro@pacbell.net to reserve your tickets. Payment must be submitted at that time. We are also looking for someone to volunteer as the Soup Bowls Coordinator. If you are interested in serving on the planning committee, please contact Claudia Thorn at 961-8291. Let's make this year's event a major success. The History Center has been open every 2nd Sunday from 1:00 to 4:00 pm. Thanks to the following people for being a docent: Jean Applegate, Lois Frazier, Larry and Meg Smart. The History Center will not be open on Easter Sunday, April 8th. The Center will be open on May 5 & 6 for the Fair Oaks Fiesta. The hours will be from 10:00 am to 4:00 pm. Docents will be needed for 2 hour shifts on these days. On May 26 the Fair Oaks Cemetery will have their 14th annual Memorial Day celebration. The theme this year will honor Civil War veterans, "The Strengthening of a Nation." Did you know we have 6 Civil War veterans buried in our cemetery? The Historical Society and Fair Oaks/Orangevale Grange will serve cookies and lemonade. President Ralph Carhart following a delicious potluck called the meeting to order. Ralph welcomed all attending, and thanked Judy and Warren Blomquist for setting up the decorations and kitchen. He also thanked Jim Pearce for the Newsletter, Trude Vasquez and Maria Brugger for the publicity and program, also Claudia Thorn for organizing the wine and raffle. 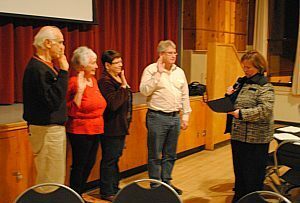 Installation of Officers: Following the program, Supervisor Susan Peters installed the officers for the 2012 year. The officers installed were: President, Ralph Carhart; Vice President, Trude Vasquez; Secretary, Janet McWilliams; and Treasurer, Joe Dobrowolski. The minutes were approved as sent in the newsletter. The treasurer’s report and 2012 were published in the newsletter. It was moved by Warren McWilliams that we accept the budget as published. Motion seconded by Claudia Thorn, Motion passed. Annual Audit: Ken Steen reported that he had audited the Treasurer’s Books and found them to be in order. History Center: Lois Frazier reported that the History Center continues to be open on every second Sunday. She also reported that it would be open for the Silent Movie Night coming up at the end of January. Meeting Adjorned at 8:00, followed by the finish of the raffle.